Pressure solution seams or bands, shown in Figure 1 on a polished surface of building stone and in Figure 2 on a thin section, are thin zones of undissolved minerals or residue, left behind after rock deformation referred to as pressure solution or pressure dissolution (Groshong, 1988). The two surfaces defining the seams move toward each other in a direction predominantly perpendicular to the surfaces. This implies material should be taken out of the system to ensure the continuity of a deformation of any significant magnitude. Figure 1. 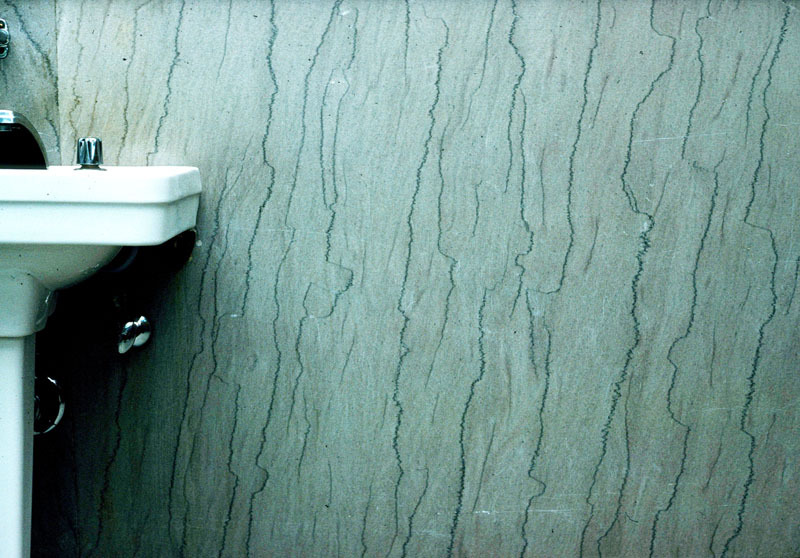 Pressure solution seams in the Indiana Limestone on the walls of a rest room at Purdue University, IN. Note that the seams are bed-parallel and originally were horizontal. Figure 2. 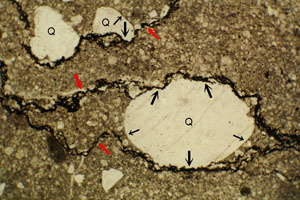 Photomicrograph showing pressure solution seams (marked by red arrows). Q is for quartz grains. Thick and thin black arrows mark the deformed (sutured) and undeformed (smooth) margins of the grains. From Railsback, http://www.gly.uga.edu/railsback/PDFindex1.html. The residue is generally dark in color and is made up of relatively insoluble or slowly diffusing components of host rock, such as clay minerals and oxides. Early in the last century, Stockdale (1922) was the first to establish the relationship between the residue and the host rock in a study of limestone, dolomite, and marble and the pressure solution seams therein from the United States craton (Indiana and Tennessee). He showed that the material in the residue had the same mineralogical composition, oxide ratios, and percentage of organic matter as the insoluble component of the adjacent host rock and therefore 'a solution residue should be nothing more than a concentration of the less soluble constituents of the rocks from which it was derived.' Stockdale as well as more recent researchers showed enrichment of insoluble elements like Silica and Aluminum and decrease of soluble elements like Calcium and Magnesium in carbonate rocks. Please refer to the section 'Residue' for more information. Pressure solution can be inferred when objects of known original shape are truncated through removal of matter, or when there is evidence of mineral re-distribution systematically around mechanical heterogeneities in rock. Objects with known original shape may include pre-existing minerals, fossils, and older depositional and deformational structures. Mineral re-distribution is accomplished through dissolution and over-growths of silica in detrital rocks and calcite in carbonate rocks by their migration from high stress locations to low stress locations. The thickness of the residue varies along pressure solution seams, which is related to the strain accommodated by pressure solution and the volume of rock dissolved. Stockdale (1922) interpreted that the height of stylolitic sutures (teeth) is a measure of the shortening across the stylolites. Please see the section on strain associated with pressure solutions. Pressure solution seams have some common orientation relative to bedding. The bed-parallel seams, often called 'stylolites' as noted earlier, are commonly the results of burial diagenesis in response to a lithostatic stress component. Those normal to bedding are commonly the results of tectonic compression. Those oblique to bedding are also tectonic and are generally splay pressure solution seams resulting from shearing on the bed-normal or bed-parallel sets. Also see pressure solution seam-vein assemblages which is detailed under 'Assemblages of Joints / Veins and Pressure Solution Seams.' Please see the corresponding link for more detailed information. After solution seams form, they may become structural weaknesses. If shear stress is later resolved on these seams, they may be sheared and become sheared pressure solution seams leading to sheared pressure solution seam-based faults. Groshong, R.H., Jr, 1988. Low-temperature deformation mechanisms and their interpretation. Geological Society of America Bulletin 100: 1329-2360. Ramsay, J.G., Lisle, R.J., 2000. The Techniques of Modern Structural Geology, Volume 3: Applications of Continuum Mechanics in Structural Geology. Academic Press 1061p. Stockdale, P.B., 1922. Stylolites: their nature and origin. Indiana University Studies 9: 1-97.